Want to be in the heart of Sydney, its history, the beauty of the harbour, the tranquility of nature, the comfort that you need with the seclusion for just you, your partner or family timeout? click here for a quote on a three night stay. The old Sydney Quarantine Station is for you! It’s a historic monument to the beginnings of the European settlement in Sydney. I was looking for a wedding anniversary getaway. 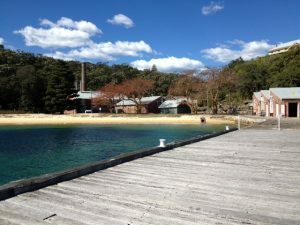 Off season, it was very affordable compared to the central Manly hotels. So off we went, and other than dining out at night in Terracotta Ouzeria and The Pantry overlooking the Manly Beach – oh and of course the Boathouse for breakfast. Perfect! All cars are left at the Reception carpark and not allowed in the historical Quarantine Station. This immediately slows you down to walking and being in the moment. Not racing, not driving, in fact not doing much other than breathing in the fresh air, the views from North Head to Manly, Balmoral, Watson’s Bay, the Sydney skyline, The Ocean from your verandah or nearby! If your room is at the back of the old dormitories, just move the outside seats to the front in the sun, sit peacefully looking at the view and wonder why you haven’t been there to spend time before. 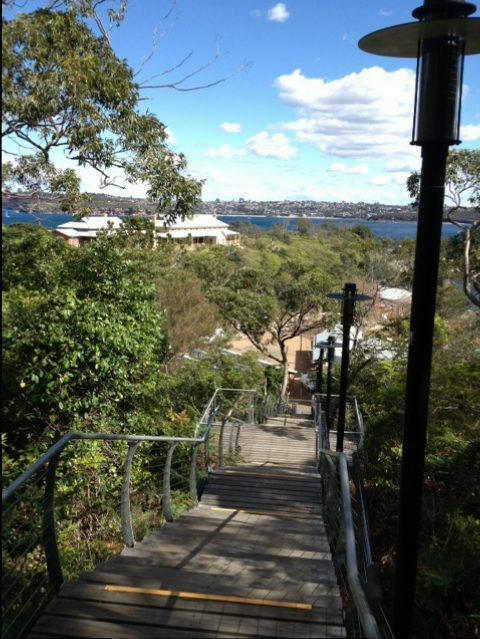 Geoff and I wandered down the old Funicular rail, used to send supplies from boats to the Quarantine Station but now replaced by stairs. We had lunch at the café and were delighted to see 2 whales frolicking around Collins Beach not far away, followed and protected by Marine Patrol boats. At the Q Station Wharf we wandered through the museums and old parts of the Quarantine reception station where all and sundry were taken from the ships and put through carbolic acid shower facilities to kill any infestations that were travelling along with them. After some public protests about the tent accommodation and a Royal Commission into the lack of facilities in the 1880s, the quarantine inmates were herded into 1st class, 3rd class or Asiatic accommodation. Testimonies to those quarantined are still there today on the sandstone rocks in the form of chiselled inscriptions which include dates, ships of passage and names of passengers, and overlook todays café patrons. I felt that those who left their mark, needed some kind of acknowledgement of the months spent at sea only to be isolated on a headland without the present day skyline as a symbol of hope and resettlement. I had forgotten the ghostly reputation that Ghost Tours advertise at the old Quarantine station. I was reminded by one lot of 20 somethings, animatedly discussing the hauntings while in a Van ride to reception, awaiting their Ghost Tour. Alas we didn’t hear or see a single ghost in the two original converted dormitories in which we stayed. 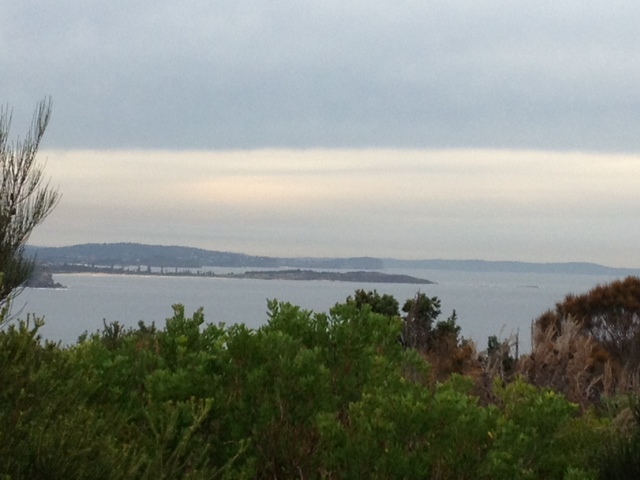 They were eerily quiet amongst the North Head flora on our stay. One of our rooms had an allocated outside bath/toilet and the other, an ensuite. In fact we thought the outside bath/toilet a fun alternative to what we normally have and this room came with a lovely breakfast within walking distance. 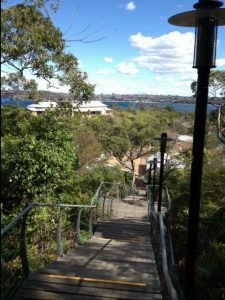 Another day was spent sightseeing at North Fort – the Sanctuary at North Head – while joining a tour of the old WW2 gun battlements and underground tunnels and the remembrance walk on this old military site, once considered Sydney’s defence. 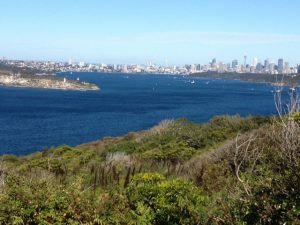 We also walked the ocean track at North Head and as luck would have it, on the wind swept precipice, we farewelled the 2 whales seen the day before, emerging from the harbour, ducking and spraying along the Northern rocky head outcrop. They were followed by a small flotilla (at safe range) out to the larger currents and shipways after a few days sheltering in the Harbour coves. 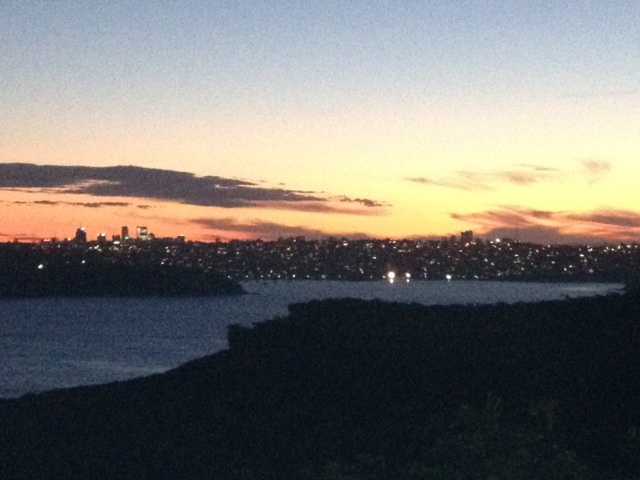 A somewhat spiritual experience among the rocks, windswept bushland and breathtaking Harbour we all know as Sydney. Another morning we found the bush track from North Head to Shelley Beach and were reminded along the track of the original owners of this land, the Gayamaygal people who used the area as a source of medicinal healing, where middens and engravings give testimony to its ancient living sustenance. These first people no doubt regularly saw the seasonal migration of many whales up and down the coast. It would be fitting to have an indigenous ranger here taking tours as well to keep the ancient local storytelling and bush tucker alive. Our friends from Beacon Hill joined us at the Q Station Boathouse Restaurant for drinks before heading down to manly to eat at the Pantry Restaurant. I love the Crisp Confit Duck there cooked to perfection! My girlfriends and I dined here while we stayed in Manly for our yearly get together in 2015 and found the Duck confit. This was within the same year I declared the best Duck Confit in a restaurant in Paris, France in the Latin quarter. However The Pantry Duck Confit is now top of the list. August is a little chilly so you need warm clothing on North Head where the wind factor can pick up in the mid afternoon. However all rooms have heating and you can set the dial at 18 degrees plus when out dining and come back to the luxury of a warm hideaway. The best rave about this place for the over 60’s is the in-house Van that continually picks up and delivers patrons from the reception to accommodation and down to the QStation beach where you can have a café lunch or dine a the Boathouse on Q Beach. Just dial reception and wait to be picked up! Well, I hope you love the North Head experience as much as we did! It is still charging my batteries……..and I want to go back.